This is yet another one of those recipes that I can't believe I haven't posted before. 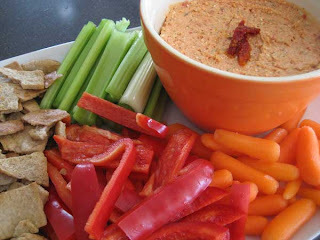 I served this Chips and Veggies with Sun-Dried Tomato Dip along with the Garlic Herb Spread on Super Bowl Sunday. Yeah, I'm a little behind on posting these recipes, so sue me. Every single time I have made this dip, someone has asked me for the recipe. I know there is a shocking amount of feta cheese in the recipe (which means it also isn't cheap), but you gotta just go for it. For some reason, it doesn't scream feta once you start eating it. Maybe because of the strong sun dried tomato taste? I use this as my "healthy alternative" dip at parties, but it's so good I think people don't even know I'm giving them something healthier. As you can see, I serve it with pita chips, red bell peppers, carrots, and celery. I think it would also be good with Triscuits or slices of sourdough baguette.